Eligius was a young man and so it was surprising that he had been selected for such a prestigious assignment: to craft a throne from gold for king Clotaire II. Eligius had become a goldsmith not because of a great personal desire to work within a trade renowned for its corruption but because his father recognized a certain amount of natural skill and talent in him for the work. Out of a desire to see his son succeed at his goals, Eligius' father had him apprenticed to a famous goldsmith in Limoges. Eligius had enjoyed his time there and had learned to enjoy the trade selected for him. By the time he left his master in Limoges, he felt as if this might be a good job for him even if it didn't feel like a calling. He had left to take a position under Babo in Neustria among the Franks. 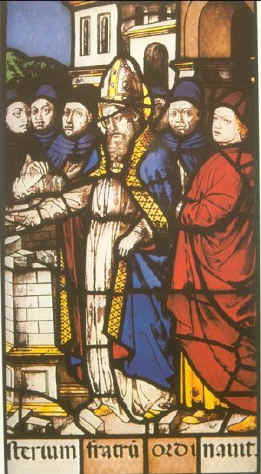 Babo was the royal treasurer for the Frankish kingdom and had the ear of Clotaire II. So, when Clotaire wanted a throne made from gold, Babo turned to his new goldsmith and informed him of his new task. With little hesitation and less fear, Eligius took to his job and collected the amount of gold allotted to him for the work. Eligius was confused as to why so much gold had been given to him when his calculations suggested he didn't need nearly that much. As he sat in his workshop with the fabulous gems and large amount of gold, he decided to make the best throne he knew how to and simply trust that he had learned how to do his job to the best of his abilities. When he finished the first throne and had placed all of the precious stones on it, he looked again at the remaining stones and gold--there seemed to be enough for another throne of equal quality and weight. Not knowing what else to do, he made a second throne of equality quality and weight and presented both to Clotaire. At the time, it was the policy and practice of most goldsmiths to keep a large portion of the gold for themselves. They filed away pieces and burned up others so that when they had finished the work, they were all the more wealthy. Eligius kept no scrap of gold and, instead, presented king Clotaire II with two golden thrones comprised of every gem and ounce of gold given him to utilize. Clotaire was astonished at Eligius' shocking honesty. 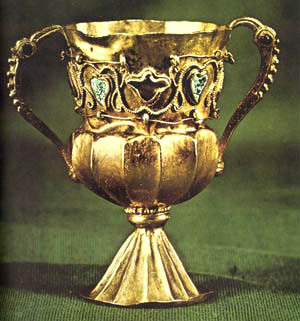 Eligius was rewarded handsomely for his craftsmanship and dependability and set a new standard for Frankish goldsmiths. Soon, Eligius had more gold than he ever could have stolen--gold on the edges of his robes, gold on his fingers and neck, gold in his pockets--and his reputation was cemented as an honest and dependable man. Yet, it was then that Eligius suddenly seemed to understand calling. He had been given a gift of crafting and forging gold with the skill of an expert and artisan but this was not his only calling in life. Eligius felt a calling from the God he worshiped to serve him and give back from the abundance granted to him through his gifts. Eligius gave away his expensive clothing and was rewarded with more. When he was rewarded with more, he gave this away. The people could not understand why Eligius was so keen to give away what had been given to him but what they failed to understand was the passion burning in his heart: a passion to help the poor, sick, and needy. Eligius would pass through other professions--adviser, artist, diplomat--but always remained committed to his calling to take care of those in need and those outcast by society. As one who crafted what the society found valuable, Eligius was given many opportunities to free slaves and ransom prisoners. Eventually, Eligius was elected priest and bishop of Noyon, France, and Tournai, Belgium. As a preacher, many were drawn to hear his homilies by his fame as a goldsmith and friend of the poor. His most exquisitely crafted sermon was the life he lived in full view of a culture that had made mistakes in prioritizing wealth over people. By forging and crafting gold, Eligius was able to right this injustice and lead many to the blessed redemption found by losing everything to gain the only thing that mattered.